[Top 6 Reasons] Why Your Content Marketing Campaign Failed | GUI Tricks - In Touch With Tomorrow! 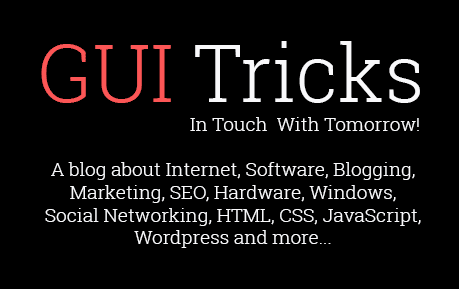 [Top 6 Reasons] Why Your Content Marketing Campaign Failed - GUI Tricks - In Touch With Tomorrow! Writing a piece of text can make a whole lot of diffrence to the marketing stratergy that you are currently working on. The big dogs have a specific amount especially dedicated to running Ads or implementing marketing practices. Those who want to have a book written in a day can never be able to establish anything in their life, not because they ain’t talented, but they lack drive. The prime or main objective of working on the marketing is to generate more leads, making the world to know about the company or organization and lastly building a brand that will stay for a longer period of time. History has many stories that sucessfully explains the worth of a advertisment, for example the famous Apple Inc Ad in early 80s is still known of breaking the jinx and till today, it is know as the most rermarkably made ad in the history. 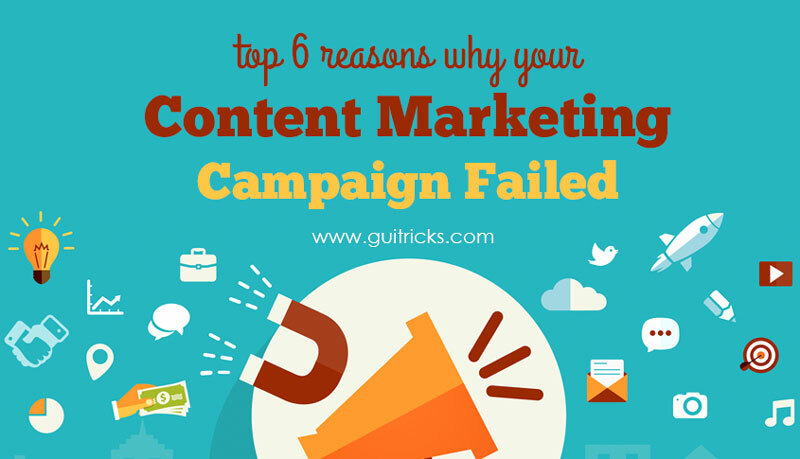 Have you every given a thought about why some of the content marketing campaingn failed? What went wrong with them and what are the reason for their fall. Here, we have consolidated major reasons that are preventing your business to reach its full potential and a Powerful Content Marketing Plan That Sparks Growth. Content is what gets crawled in a search engine as that will eventually bring the traffic for you. The one major error that most of the newbies do is not worked properly on the C.P (Content Plan) and as a result of which their campaning flew in the dust with in no time. Here, are the few examples! Have you ever thought of considering to read about the content stratergy that your competitors have been following? We have mentioned it before that all you need to have is to learn from the people that are already in the industry and the smart onse have already learned their lessons from the big dogs. Too much use of self praising vocals and considering yourself as the best in the business is not the right way to approach users. Hence, Rejected! 2. Our product “XYZ” has got the new improved formula that gives you a great time with out any complications. Absolutely simple and effective! Without using any sort of self praising vocals. Hence, will engage more customers. The customers of today are extremly smart and knows something fishy in the water. So, if you are thinking to fool the customer by pitching tons of empty promises or the services that you know, you can’t deliver than there’s absolutely no reason, why you should draft something like this.! Yeah, you heard it absolutely lound and bright. Search Engine optimization is what gets you traffic and doing it with a lame approach would kick you out of the game in a matter of few stokes. Your target audience would find your blog or website via a keyword on a search engine and doing it properly by naturally adding keywords without making them look like artificial one. There are various kind of organic and inorganic marketing approaches that have been used in the internet today and people having little or not so much of knowledge often consider the latter one for the answer. A well planned SEO is possible the best approach that can give you traffic and eventually generate business for you. Understanding the target audience is the best way to come up with a stratergy and organizations that are selling a product or providing their sevices must consider this. Have you learned about competitors? Are you providing a solution or just promising something vague. Considering your target audience as someone you can fool around is possibly the worst decision that you could ever make. Be smart, your biggest competitor could be your biggest teacher as well that can guide you through the route in a well directed manner. What’s your purpose of driving a marketing campaing? Are you looking to build a brand value? Do you want to engage more people? Are you still looking for a way to be the best in the industry. Well, now days you can learn each and every thing via tools and amazing metric’s system. This is strong groundwork for a successful digital marketing campaign and you can learn from it a lot! The smart work is always to think diffrently without being diffrent. Monitoring how your work went is obviously the correct way to think as that would obviously give you much exposure to the competition. What’s the first think that comes to your mind, when you visit a website? What’s ther first impression you have when you read a piece of content that’s just being placed on the bottom? Around 70 – 80 percent of people often decide in first 5 seconds if they would like to continue with the web page that or not. In order to reach maximum audience and make people to engage in your website you need to focus on writing the correct content as soon as possible. Running a marketing campaing won’t be of any use, if you aren’t able to reach out to the audience in the best possible manner. Make Content youyr strength and not your weakness! Everything takes time to reach a particular stage and if you’re expecting a miracle to happen overnight that you my friend are badly mistaken. No campaign would work unless you plan accordingly and act in the best possible manner. For a content to flow all across the web and become viral all you need to have is to do things in a manner that grows with the matter of time.We request you to give time a little time as slowly and gradually things will reach a new height very soon. Here, the thing, when you put the content on the web, slowly and gradually it will grow and reach a place where it will be indexed on the top position of the search engine. Slowly your write up will be shared on the social media and so as its reach. 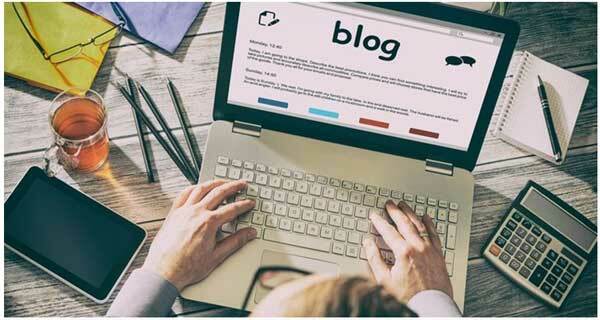 Make sure to give your article a little time so it will grow and become the next big thing on the internet. Melissa D Jordan is a content writer who specializes in social media icon; email marketing campaigns and push notification. She had started her carrier from Growth Funnel in 2015. Growth help business and startups personalize their marketing like never before. Thank you. Stay in touch with us.